So obviously, you can tell from reading past posts that I’ve been dealing with some anxiety here. A lot of it social anxiety. In one of my business groups on FB today, I shared my social anxiety with the group. The leader of the group, a fellow magician, reminded me that it was okay to use magick to help me deal with my anxiety. He suggested that I create a sigil for good sales at the convention, and feed it all my anxiety. I laughed because I was like, “Why didn’t I think of that?” But again, I’m one of those magicians who has always lived by the maxim that one should not whip out their wand for every little situation lest one become too dependent on magick to perform even the simplest of tasks. Then again – I have a LOT of anxiety. It’s hardly little. And if I feed a sales sigil all that anxiety – that’s going to be one hell of a powerful sigil. LOL So I said, “What the hell – let’s do this!” Aside from the Sorath work, this is probably the most solid enchantment (aside from the tablet and meditation work) I’ve done this month. SO my sigil is ready. Already fed six million bushels of anxiety since three this afternoon (I’ve been carrying it and feeding it every time I feel that wave of anxiety). LOL I have to admit, holding it to my chest provides a great deal of calming relaxation. About 30 more hours of anxiety to feed it — at this rate, all the authors at our table (and the surrounding tables) will run out of books to sell. 😉 Ya’ll can thank me later. HAHA j/k Though I do suspect sales are going to be fantastic – sigil or not. There are a lot of fabulous authors at our table. That said I won’t post a picture of the sigil just because I don’t need haters trying to co-opt the sigil for whatever reason. Yes, some magick is best kept to oneself until after the fact. Perhaps I’ll share it AFTER it’s served its purpose. 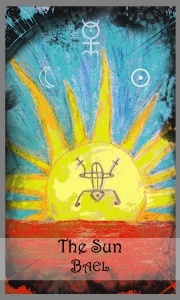 Today’s Lenormand Card: The Tower – Setting limits. Independence. Taking care of one’s health. So, I set a limit for how long I was permitted to bask in my stress. I have been doing intermittent meditations with my sigil to relieve stress and anxiety and power up sales for the weekend, I’ve upped my water intake and done walking today to calm the swelling in my left ankle, and I forced myself to edit and judge manuscripts today. Hail Hydra…. I mean – yay sigil. This entry was posted in health, Magick, the writing life and tagged enchantments, health, It's okay to use magick, relax, social anxiety, wand whipping by Steph. Bookmark the permalink.